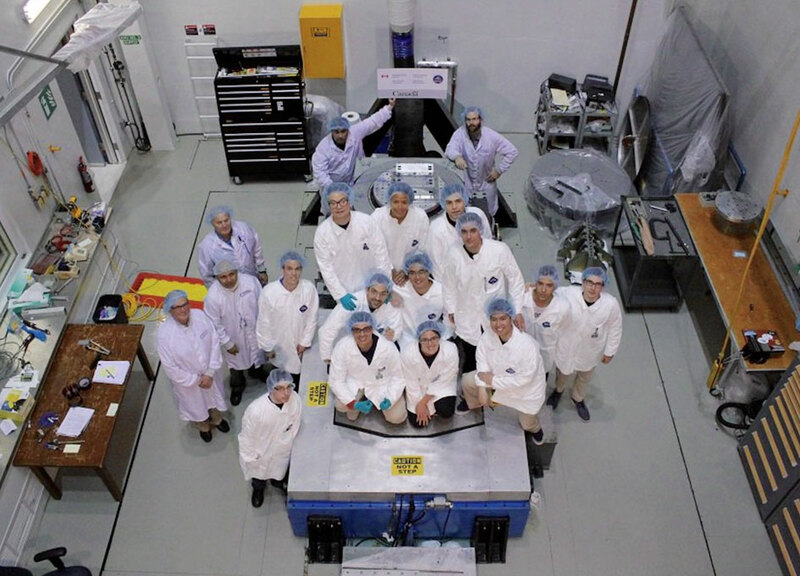 The Concordia University and École Polytechnique de Montréal teams in the DFL Vibration Test Facility. Credit: CSDC. A total of eight university teams took part in the challenge. 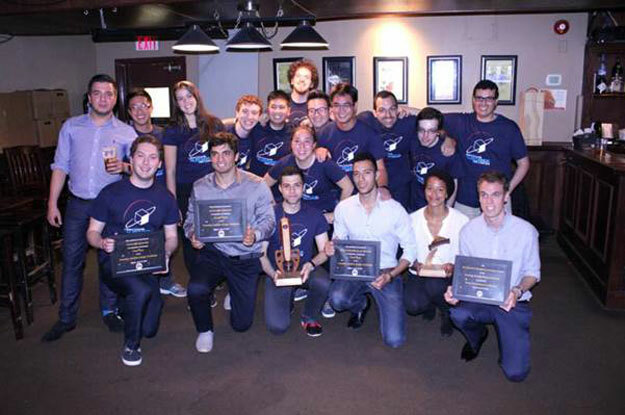 Second place went to the University of Manitoba and third place went to the École Polytechnique de Montréal (EPM). The EPM team was also awarded the UrtheCast Educational Outreach Award for their community outreach efforts. The other universities participating included the University of British Columbia, University of Toronto, University of Victoria, University of Waterloo and York University. 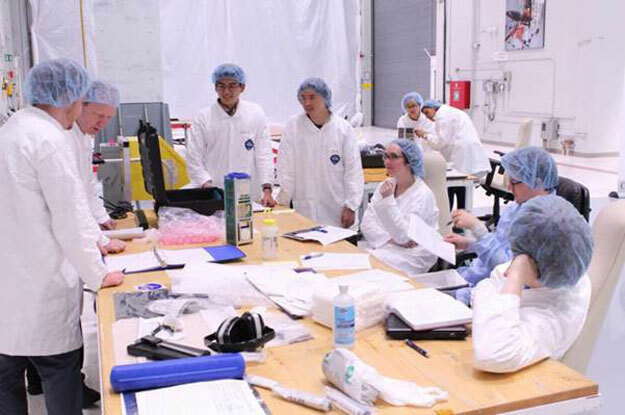 The goal of the CSDC is to give participating students a solid foundation in satellite design, project management and experience working in a large, inter-disciplinary team setting. At the end of the competition the winning team satellite is deemed ready to take the next step which is to launch and complete its mission in Low Earth Orbit. The winning CSDC teams with their trophies and plaques. Credit: CSDC. Judges inspect the entry from the University of Waterloo. Credit: CSDC. The competition is supported by the teams universities and the following sponsors ;Boeing, MDA, UrtheCast, Magellan, Defence Research & Development Canada (DRDC), The Canadian Space Agency / David Florida Laboratory, Mitacs, Tri-University Meson Facility (TRIUMF), and Analytical Graphics Inc. Unfortunately neither of the previous winners has had their satellites fly. When I asked Reeves whether this years winner would have their satellite fly, he said he was trying to make it happen. As was evidenced earlier this with the success of the first Canadian SmallSat Symposium, small satellites are very much in demand and it appears Canada has an opportunity to play a greater role in this fast this growing industry. And competitions like the CSDC are developing young talent. But what does it say when a competition like this can’t find enough support to complete the process and fly the winners satellites? It seems that there is a clear opportunity for the Canadian government and in particular the Canadian Space Agency to step-up now and invest in these talented students. What would it cost? For approximately $221,000 U.S,. Concordia’s satellite could be on its way to the International Space Station on resupply mission where an astronaut would launch it from the satellite launcher on the Japanese module. Why can’t we do that? The author, Marc Boucher, is the former CEO of the Canadian Space Commerce Association (CSCA) and wrote a recommendation in support of funding the Canadian Satellite Design Challenge in the CSCA’s Budget 2016 Brief.